When I concluded part I of this feature last week, I said that this piece would be about the Sonata and Optima. It will. But for those of you who came looking for a more traditional road test, I must apologize. You won’t find that here. Feel free to ask specific questions about the cars, but for this piece, we’re going down a slightly different path. If you ask somebody on the street to identify the most “American” car they can think of, you’ll probably get a predictably narrow subset of answers. SUVs and pick-up trucks will probably top the list, with the occasional Corvette or Mustang thrown in for flavor. Some may even identify entire brands–Jeep or Cadillac, for instance. Others may reflect on our heritage of being one of the largest sources of mass-produced goods in the world, and then prattle on endlessly about the Model T.
But they’re all wrong. You see, the above cars may be icons of the American auto industry, but they simply represent what we’re good at. Those are cars of and by Americans, but not for. Anybody can appreciate a well-built truck or a go-anywhere SUV, but for our purposes we must look elsewhere. Indeed, to find a reflection of American culture, you need to look a a segment which, ironically enough, American manufacturers seemed to have virtually abandoned until very recently–a segment so seemingly devoid of character that it has been dominated for nigh on twenty years by the Toyota Camry. Yes, dear reader, the quintessential American car is the mid-sized sedan. That’s right. The four-door. The grocery getter. The family car. And what is more American than family? You can put the Bill of Rights, George Washington, Martin Luther King, a truck full of apple pies and every member of the Boston Red Sox on one side of the Americana scale and they wouldn’t stand a chance against John and Susie Suburbanite and their 2.3 children on the other. So while trucks may be the most individually successful models sold in the United States, they simply stand in the shadow of the mid-sizer when it comes to brand identity. Toyota owes its reputation in the United States to the Camry, and Honda to the Accord. Just ask Volkswagen why its Chattanooga plant and the B7 Passat are receiving so much attention. Do you remember what VW brought over in this segment in the 1970s and early 1980s? Don’t be ashamed. Outside of dedicated enthusiasts and the VW faithful, most don’t. Without question, if you, as product planner for an overseas auto manufacturer, seek to launch a full-blown assault on the U.S. car market, you had better start with the best 180″, 5-seat, four-door, trunk-adorned family hauler your engineers can produce. And you had better be prepared to see it thoroughly eviscerated by everybody from journalists to politicians to members of the buying public. And if it’s praised? Well, it had better be perfect in every way, or you’ll get a year out of it, tops (the car advertised above is a testament to that). But it really doesn’t matter how good it is. Ask brand strategists from any mainstream foreign auto maker who targeted the U.S. market; you’re simply not allowed to get it right the first time. In fact, being the fledgling U.S. arm of a foreign automaker places you squarely at the bottom of the totem pole. Perhaps you’re pushing value proposition to draw initial customer interest? To those with stake (be it emotional, financial, or simply the product of overzealous fanboyism) in established brands, this means your cars are cheaply engineered/assembled. Offering aggressive financing deals or significant discounts from MSRP? Your cars are for poor people. Have you built something for John Q. Public to drive daily? You’re catering to the sheeple. Is your car more enthusiast-oriented, with performance features not found on most other mainstream sedans? Hah. Clearly you don’t understand the U.S. market. For enthusiasts, the above may not make sense. Indeed, niche manufacturers have it pretty easy in this regard, assuming of course that they’re content to remain such. A Lotus Elise doesn’t rely on other volume offerings the way a Mazda Miata or Volkswagen GTI does. It simply sells on its own merits, isolated by its premium price tag and mission-specific packaging. But in order for Mazda to sell you the aforementioned MX-5, they have to move a good number of rather mundane commuter cars with some degree of regularity. If their volume family sedan doesn’t move, there’s cause for concern. Hyundai has been in the U.S. Market for more than 25 years, but never really moved in noteworthy volume until the last decade or so. They sold enough to continue the experiment, from the Mitsubishi collaboration in the early 1990s to the eventual purchase of interest in Kia in 1998. It wasn’t long after that the first models with said branding on the boot made their way to our shores. 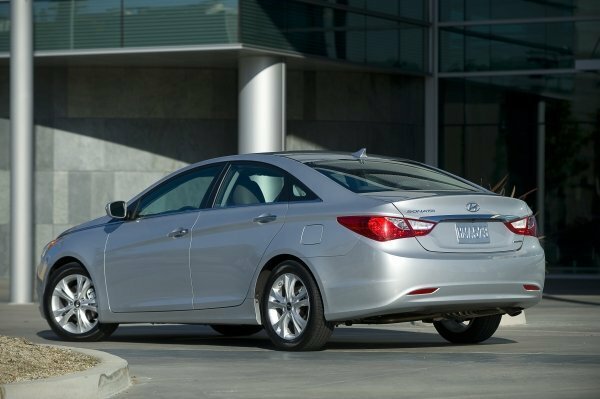 As the years went on, volume increased while reliability improved by leaps and bounds, but even as recently as the early-mid 2000s, both brands were still squarely in the “poor zone.” Around the middle of that decade, however, Hyundai finally started to take hold with more affluent buyers. The current and previous generations of Hyundai’s Santa Fe, Tucson and Sonata have established themselves squarely in Toyota territory, edging out just about everybody in initial quality and long-term service. Volumes are way up. Incentives are way down. Critical reviews are almost unanimously positive. 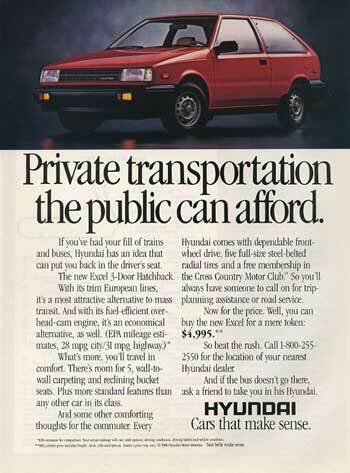 And thanks to Hyundai’s bootstraps, Kia is playing a monumental game of catch-up, coming almost as far as its parent has (in 25 years) in just two and a half generations. But to many auto aficionados and even a handful of casual observers, they’re both only one step removed from penalty boxes. A strange hierarchy evolved in the world of automobile brand perception here in the U.S. Some variant of this probably exists in every market, but the gist of it is this: At first, there were the domestics. They were the best, because they were it. You bought a Ford or a Chevrolet because that’s all there was. And then the premium brands appeared–the Cadillacs and the Lincolns, etc. So now there was something for the luxury buyer to look down upon. This left the Ford and Chevrolet drivers feeling quite left out, so they spent a few years taking their frustrations out on each other, building a fierce rivalry that exists to this day. Then, as if by divine intervention, the imports arrived–small, fragile, European things with two seats and undersized radiators. Suddenly, the mainstream domestic buyer had somebody to pick on. But the imports had something that the Fords and Chevrolets lacked–exclusivity. And so the Jaguars and the Alfa Romeos and the Ferraris took their place above the mainstream domestics, putting them in an odd parallel position in the pecking order with the American premium cars. Their owners looked down on each other, but they also collectively looked down on the lower-tier manufacturers. In this fashion, each successive new entry into the U.S. market becomes the sh*tbox brand du jour, and fans and owners of “established” brands then feel obligated look down upon the rookie with exaggerated scorn, thinking themselves now equal to those who previously ridiculed them, whether or not that is indeed the case. Think of it as “separate-but-conditionally-equal.” For evidence of this pecking order, just look at the way fanboys of every stripe take pot-shots at Honda. A Chevy guy calling a Civic Si gutless doesn’t think himself equal to the kid who just bought his first 1.8L GTI. Then again, the VW virgin probably thinks he just bought himself a ticket to the BMW and Benz club, but that’s a whole different discussion. Neither the Sonata nor the Optima is a game-changer. They’re class-competitive, yes, and they’re easy to recommend against just about anything in the segment without dissonance. They handle and ride well enough, with a nod to the Optima for slightly better chassis dynamics, but another to the Sonata for being quieter and more plush. Both have very good interiors. Both have lots of desirable features. Both are excellent value for money. 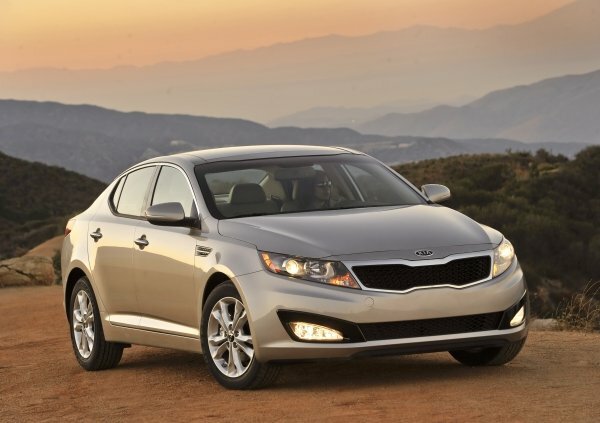 In the Sonata and Optima, Hyundai/Kia have developed two good cars. Cars which, were they in any other segment, might be largely inconsequential to overall brand image. Instead, being what they are, they’re the face of their respective marques and the standard bearers for their reputations. For the reasons we discussed above, these cars are now deliciously controversial. And best of all, they’re both legitimately competitive. Throw in a few brand loyalists and a handful of entirely forgivable flaws with the vehicles themselves, and you have a recipe that will magically turn otherwise reasonable people, even individuals who claim to be car enthusiasts, into frothing idiots. But why? After all, they’re just family sedans, right? Bottom line, there are many who will dismiss these cars as garbage without a second thought. Those people feel threatened, period, over and done. There’s no telling why exactly. Maybe they’re true xenophobes who think all Koreans reside north of the 38th parallel and do nothing but tinker with homebrew nuclear ICBMs. Maybe they had friends who bought an ’87 Excel and saw it crumple to the ground within a year. Maybe they have a genuine stake in the success of another brand and they’re steering you away for financial reasons. Perhaps they simply like the Passat and think anybody who would consider a “lesser” product should be shat upon. Or, quite simply, they hate the idea that their world views are being challenged. Oh, they’ll have great cover stories. They were probably mechanics at indy shops for ten years and saw nothing but rusted-out Hyundais with blown engines that would catch fire if touched by children. “Just you wait,” they’ll probably say. Sure. I’ll do that. There are also those who will take only the positives from each available review, spin them into a web of fantastical infallibility, and present it all as fact. And then they’ll vanish the instant you demonstrate any discrepancies in their assertions. These people are fools, and they’ll be on to the next upstart underdog before you can concoct an intelligent rebuttal. Don’t waste your time. But what gets both sides riled up has nothing to do with the quality of the product or its potential for success. No, what matters is that something sacred to the American auto market is being challenged by something that hasn’t yet earned the right to sit at the proverbial table. The reality is this: both are good cars, and neither is great, but I’m not taking that word lightly. In my eyes, the great cars are those for which I would put my own money on the table. Most mainstream sedans would be out of consideration immediately, but that wouldn’t keep me from recommending them to somebody else. And that’s kind of what I do here. So, should you buy a Sonata or an Optima? Go ahead and ask me. I’d be happy to tell you. Photos courtesy of Hyundai and Kia U.S. media offices and various corners of the Interwebs. Next postS:S:L Salutes David E. Davis, Jr.